The transcript idea went over pretty well, so I will plan for transcripts for my videos as long as my budget allows. 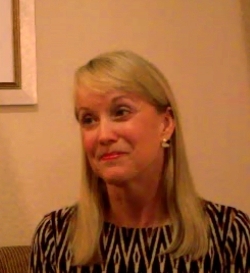 In this video, I got to speak with Dr. Ann Childers again (bet she didn’t realize that she was wearing the same outfit as she was last year!). Howard: Today we are talking with Dr. Ann Childers. And we talked last year so probably we don’t need to do quite as much introduction. I can just put a link to last year’s blog entry. So I’m basically more interested in catching up with what’s happened in the last year or so. I do know that there’s one special event that has happened to you very recently. Howard: That I’ve been able to tell a difference in your demeanor. Because last year you were… ok, serious part of the time, this year you’ve been lit up like a Christmas tree. Big ear to ear smile. Every time I’ve ever seen you on the cruise. So tell us about this special event. Dr. Childers: It is a very special event. I am now engaged to Stan Curtis and I’m in a very happy relationship. Howard: Okay. That would explain the ear to ear smile, and all that. What else have been happening to you this year? Dr. Childers: Oh, Emily is my niece and she’s also my office manager. Emily Rohay. And she pretty much runs me with an iron fist. ‘cuz I need it every once in a while. Howard: So you have your niece as your manager now? Dr. Childers: Yeah, she’s taking very good care of the business. For which I’m grateful. And so… we’re getting the kinds of patients that we hope to get. We hope to get patients who are very interested in nutrition and sleep as an approach to their mental health care. And this has really blown things wide open. We’ve gotten some very interesting cases and a lot of successes now. So we really feel like we’re on our way. Howard: Have you been publishing these? Dr. Childers: I don’t actually publish these but I did recently publish, with Dr. Richard David Feinman, a paper on how carbohydrate restriction should be the first approach in diabetes management, whether it’s type 1 or type 2. And it turns out that that particular article is currently the most downloaded article in the journal called Nutrition. And we’re very proud of it. Howard: Now, did you tie that to Psychiatry? Dr. Childers: Yes, very much so. And in fact, what I’m learning is that the refined carbohydrates, the refined starches and sugars that are so hard on the metabolism, are also very hard on the brain. And we think it may play a part in things like Alzheimer’s which is often referred now to as type 3 diabetes. Howard: I had read some place that the brain actually makes a small amount of insulin on its own. But that Alzheimer’s is characterized by insulin resistance in the brain. Howard: That [MCT], I’ve heard about. I haven’t heard about Axona. Dr. Childers: Yeah, it’s a medical food and it’s based on medium chain triglycerides which come from coconuts. And it actually helps to produce ketones in the brain so that the brain has fuel to use even when someone’s not on a ketogenic diet. Howard: Yeah, I recall the book from Dr. Mary Newport about that what if there was a cure… I don’t think there’s a cure for Alzheimer’s but there’s certainly seems to be a way around the metabolic block. Dr. Childers: Yes, it seems to help a lot of people especially people that don’t have the APOE-4 type of Alzheimer’s. Many of these people can be helped. Dr. Childers: APOE-4 is a marker that they look for as a risk factor for Alzheimer’s. But it’s not the only associated marker for Alzheimer’s. Howard: Is that a genetic marker? Dr. Childers: Yes, it’s a genetic marker. Howard: And the people who have APOE-4 gene don’t have much resistance to something or…? Dr. Childers: Yeah, they’re more likely to get Alzheimer’s. They have a higher risk. Howard: I wonder if I should get myself tested. Georgene: Is that a test that is available? Dr. Childers: I would think so. Yeah, it’s genetic testing. Howard: Now the places where you can go and get genetic testing have come under scrutiny and additional restrictions like the 24  and Me was actually out of business for a couple months and then they came back and said we can do this but we can’t tell you anything about what we’ve measured ‘cuz that’s practicing medicine. I’m not sure I actually understand all those restrictions. And I guess I should’ve done that back before the restrictions so I can learn more about what was going on. Dr. Childers: I’m not sure of the APOE-4… APOE-4 is actually the blood marker but it does… it suggests that there’s a genetic component. Howard: Now, just kinda refreshing from last year… you actually have diabetes, right? Dr. Childers: Yes, I have type 2. Howard: And how long have you dealt with that? Dr. Childers: I’ve dealt with it probably for the last 7 years but I probably had it for longer than that or at least I had pre-diabetes. Howard: So you didn’t really actually start controlling it until about 7 years ago? Dr. Childers: About that, yeah. Howard: And what difference have that made in your life and practice? Dr. Childers: Wow. It has helped me understand a lot of my… many of my patients. One of the things that people don’t realize in America is that probably around 46% of us… I should say the adult population over age 20… has either pre-diabetes or diabetes. Either have one or the other. Dr. Childers: Yes, and by the time someone is diagnosed with diabetes, a lot of damage has already happened… to the eyes, to the skin, to nerves, to the brain… so it really behooves us to advocate for ourselves and find out if we are at risk. Howard: I remember hearing recently… It may have been Georgene who heard it and repeated it to me that the people who have blood sugar problems and the people who don’t have blood sugar problems…are actually the people who test their blood sugar and the people who don’t test their blood sugar. So probably the percentage is maybe worse than 46% or whatever. Dr. Childers: It could be. I certainly think refined sugars and starches should not be eaten. At all. I think they should not enter the human body. And I think that our early ancestors did not have these things and that’s why they had no tooth decay. Howard: Have you been following this foofaraw around resistant starches? Howard: What do you think of that? Dr. Childers: I’m not a believer, frankly. Howard: You’re not a believer. Dr. Childers: I’m not a believer, no. For one thing, if you want to make butyric acid… if these resistant starches are making butyric acid First off, they’re probably doing it in the colon… that’s the last part of the gut. So are only those cells are being fed? And then my next question is, butyr…/butter? Why not just eat butter? Howard: Oh yeah, I am definitely looking forward to that. Dr. Childers: I’m gonna show you some charts that are going to blow you away. And then, basically a Swedish team took a look at this and based on time-to-weening and for a human being that’s anywhere one to two years, let’s say if we were hunter-gatherers, for chimpanzee or gorilla about 4 years. So based on time-to-weening and brain development, this team formulated an equation and started putting data from 70 mammals into this equation and it turned out that when the data from human beings was inserted into the equation, we turned out to be carnivores. Dr. Childers: Carnivores… and not Omnivores… no. Howard: That’s kind of embarrassing because I still eat vegetables. And I… who was this fellow named Peter… he was a veterinarian… he writes a blog called Hyperlipid. Are you familiar? Howard: He says that every once in a while he does take vegetables and feeds them to his chickens to convert them into food. But occasionally uses vegetables to season his food. Dr. Childers: Well, if you think about it, someone actually did a little blog on this; I thought it’s very interesting… They took like a quarter pound of liver and figured out how many tropical fruits they would have to have for the equivalent nutrition to a quarter pound of liver and I think they’ve come up to 8 pounds. But here’s the deal that’s really interesting… if you take a look at the great apes and you take a look at what they are doing with their food, they are basically fermenting their food. And they are a 1 number 1 fermenters. They are wonderful, excellent fermenters. And so are pigs and rats who are omnivores, excellent excellent fermenters. And so you would think, well human beings, don’t we eat a lot of vegetation? We do. The closer to the equator you are, the more vegetation you are likely to eat. Are we great fermenters? Actually we are terrible at fermenting. We are as good at fermenting fruits and vegetables as cats and dogs are. Howard: Well dogs would be a little bit better because they are not complete carnivores. Dr. Childers: They are… they’re considered facultative carnivores. Dr. Childers: So basically, for us to eat vegetables, we have to do something to them that no other animal can do. Dr. Childers: We have to cook them, we have to pickle them. At that point, they are fermented and they become a super food. So we’re doing outside of our bodies what the gorillas do inside their bodies. Howard: I have heard a lot of recommendations for fermented vegetables like kimchi and sauerkraut. Dr. Childers: Yes, natural fermentation is actually quite good for most of us. There’s some people who cannot tolerate that. But for those of us who can, these foods become super foods. Howard: Georgene can’t tolerate the sauerkraut. Dr. Childers: This is no good for you, yeah. Howard: She can’t get it past her teeth. Georgene: When my son was a baby, he would say, do I have to eat that sauer-crap? ‘cuz I mean, he was a baby… he was just barely talking… but to him it was sauer-crap. Dr. Childers: Sauer-crap. Aww. That’s so funny. Yeah, sauerkraut… so… or we have to breed it… breed the food so that it’s so soft and malleable that we can actually chew it apart. Because one of the parts that we have a hard time digesting is cellulose. And a gorilla can do it but we can’t. Howard: We can’t digest cellulose at all. Dr. Childers: No, so we don’t have the fermentation capacity that our nearest primate relatives have. We just don’t have it. What we did learn to do is we learned to develop tools. This is why our teeth probably didn’t have to change all that much. We still have the grinding surfaces… you know, of the omnivore. But if you look inside the gut, what you see is the gut of a carnivore. You see a very high-acid content in the stomach. And really marked inability to deal with vegetation, unless they are dealt within a certain manner. Howard: And some vegetations have some problems with anti-nutrients like oxalic acid. Dr. Childers: Yes, phytates. Phytates, and others, yeah. Plants really don’t want to be eaten. We have to get around that as well. Howard: And they don’t have any other defense mechanism other than trying to poison their predators. Howard: It’s kind of interesting. So in this, it sounds like that has been a major research project for you over the last year. Dr. Childers: Yeah, I’m not actually a researcher per se…Although I have to say, I’m grateful have had the chance to participate on this most recent paper. But I would say that I am curious. And I’m also kind of a web mole. I basically dig down and see what I can find. And I found some really wonderful things here that I think have been very helpful. Now, I just wanna mention that I’m not saying don’t eat plants but I am saying that they should be prepared very especially carefully before we consume them. Howard: Although there’s certain plants that I eat raw. Like carrots. Dr. Childers: Yes… and the problem with that… this is another very good example of misconceptions in our thoughts about nutrition. There was a United Kingdom study done in women, among women. And what they found out was that half of women were unable to convert beta-carotene into a usable form of vitamin A. In other words, if they had relied on beta-carotene as their source of vitamin A, they would’ve had night blindness and all kinds of problems. So I think we really have to be really careful about saying that our vegetation can provide everything for us. It turns out that almost half of that population could not make retinol out of beta-carotene. So I see a lot of these multiple vitamins, that their vitamin A is based on beta-carotene… if it doesn’t work for half of us, then half of us could be at risk if that’s what we’re depending on for retinol. Howard: What do you think about supplements of various types? Dr. Childers: I think they can be quite useful. Especially when someone is trying to turn their diet around or when they are relying on a diet from pastures and also from top soils that are deficient. We probably lost about up to 40% of the vitamins in our produce since the 1950’s… it’s the estimate. Howard: I have heard references that mono-culture agriculture is more closely related to strip mining than it is farming. Dr. Childers: We don’t do crop rotation like we used to. Howard: How about minerals? Any particular minerals? Dr. Childers: Minerals are really important. And there was a National Health and Nutrition Examination Survey called the NHANES and when they did that just a few years ago they found that about 70% of Americans are short on magnesium. And magnesium is highly important. It prevents things like heart attacks, and stroke. It also helps prevent high blood pressure. Dr. Childers: Yes, anxiety…. Yes, very big for anxiety. And in fact, it’s a natural muscle relaxer. If you have ever taken an Epsom Salt bath, that’s magnesium sulfate. It actually gets into your system and helps relax you. Howard: So you can actually absorb magnesium through your skin. Dr. Childers: You can. The skin sometimes acts us the second mouth. So, yes, exactly. Howard: Any other particularly important minerals? Dr. Childers: Iron, yes. For children, for women of reproductive age, especially, for athletes… Iron becomes a mineral in short supply in the United States. And zinc as well. Zinc is another one. And a lot of children with Attention Deficit Disorder have zinc deficiency and I suspect that part of this problem has to do with some of the concepts of red meat. And that red meat is harmful, that red meat can cause cancer. Red means happens to be loaded with zinc and is also loaded with heme iron. It’s probably one of the most bio available sources of iron in the human diet. Howard: I went to a doctor couple of years ago and he said I was little bit low on iron. And I said well do I need to take an iron supplement? He said, oh, no, eat more red meat. Dr. Childers: Good for him, good for him, good, very good. Yes, exactly. Howard: He was… I think his name was Dr. Pho. Out of Denton [Texas]. He was Vietnamese and Pho is the Vietnamese word for soup. Dr. Childers: Pho can extremely nourishing. It has a lot of elements that a lot of Americans just don’t get anymore. But iron for example; most of the children that I’ve ever tested who have come in to my clinic concerned about Attention Deficit Disorder had low iron. And the way I measure…. Howard: Was it in addition to zinc? Dr. Childers: I don’t measure zinc, typically. No. I usually just try to get them on a good diet. But they’re low in iron. And it turns out that iron is very important for restful sleep and also for attention and concentration. And it actually limits the brain’s ability to make serotonin and dopamine. And as a Psychiatrist, those are my stocks in trade. That is what I am trying to promote with medications that I use. You see… So if someone’s low in iron, my medications aren’t going to work very well. And that’s what ends up happening. Even in depression. So someone who has, what we call, Iron Deficiency Syndrome has what looks like a combination of Attention Deficit Hyperactivity Disorder… ADHD, depends on which Psych book you’re looking at or ADD, same thing in my book, and combined with Depression. So a lot of times they have mood swings, they are fatigued, they have temperature regulation issues, they get headaches, they’ll get sores at the corners of their mouth or feel like their tongue feels sore, or they try to chew a lot of ice, they’ll chew non-food items especially the kids. Many, many features are consistent with iron deficiency in these people who believe that they have Attention Deficit Disorder. Howard: Now, is there a problem also with too much iron? Dr. Childers: Yes, there is. And in fact this is another kind of a problem. So what I do is I make sure that I measure what’s called the ferritin level and if the ferritin level is too high, then I’m looking for what’s called hemochromatosis, which is more common in older people. But that is not what I’m seeing in the ADD population. What I’m seeing is low iron. Almost consistently, low iron. And I often, in the adults, also see low B12 and low folate or I’ll see high B12 and high folate. And what I’m learning now is that there’s people that have genetic mutation we call MTHFR who do not adequately process the kind of synthetic folate that is in our food system which is called folic acid and it’s found in flour and processed foods. And this can actually cause people to become depressed who have these genetic mutations. So it’s very interesting how e food actually feeds into my Psychiatric practice. Howard: It’s interesting that you mentioned B12, I don’t remember if we talked about it last year or not, but I did have some interesting experience with B12. I started taking it for just to see what it would do. And it turned out that it improved my hearing. Howard: And it improved my hearing in a very subtle way. It improved my pitch perception. And I’m a professional musician, which is kind of important. It is basically, I think that I had an impaired pitch perception even when I was a teenager. So now, I take B12 all the time. Dr. Childers: Wow. That is perfect. Actually, I recommend that anyone over age 50, take B12. Howard: So the folks over 50 don’t have a problem with having too much but too little. Dr. Childers: With B12, that’s generally, as far as we know… this could change… but as far as we know, there isn’t a tolerable upper limit of B12. You can take as much as you like. Now there’s some writers that are concerned that that could promote cancer. I don’t know if it does or not. But I would say that a thousand to two thousand mcg of B12 every single day for someone over the age 50, I think will give them the kind of insurance they need against certain types of dementia. Howard: I got onto that because Georgene actually won a book called “Could it be B12”. And yeah, they were saying there’s no problem with taking as much as you want. It’s the LD50, something like you know, 10, 15 lbs. Dr. Childers: Yeah, you choke on it first. That’s true. Howard: And so, I figured, you know… Looks like something reasonable to try. I was very surprised with the effects. What else should folks over 50 be looking for? Dr. Childers: Well, probably that should be the big one. I had a woman in my office who is in her 60’s and she’s been in the same job for 25 years and suddenly she couldn’t… you know, over time, she just couldn’t do it anymore. And she started staring at the window and became practically mute. And I did a… it’s called a SLUMS – the Veterans Administration has this instrument that I can use to try to find out if someone is like borderline demented or demented. And it turned out that she was marginally demented. So I put her on B12 because she was low in B12, and lo and behold, she starts talking again, she starts doing her work. It was remarkable. That happened with in about 3 weeks. Howard: Yeah, the thing about in the book was that B12, even some clinical deficiencies, could be mistakenly diagnosed for things like really, really awful like ALS or MS and other dread diseases that are considered to be incurable. Dr. Childers: Neurologic, yes. Neurologic diseases. And the thing about being 50… the reason 50 is that magic number, is because at that point that we start developing, what’s called, Atrophic Gastritis, which about 20% percent of us is going to have. Howard: So what is Atrophic Gastritis? Dr. Childers: So what happens is the stomach no longer produces as much acid as it used to. And I suspect that especially people who are in proton pump inhibitors are going to have special problems with this or people who take Metformin are going to actually lose more B12 as well. So some of the medications that we take also influence how much B12 is circulating. And given what you just said, you can tell it’s really important thing to keep in your radar. Howard: I’m a convert. I believe in taking vitamin B12 just because it improved my hearing. I also believe in taking MCT oil because it seems to improve my cognitive functions. Howard: And I didn’t bring any MCT oil with me ‘cuz it’s so hard to contain. But I have been eating lots of butter. Howard: I ran into a very interesting lady last night who had a blog called EatTheButter.org which… if I can arrange, I may get her to do an interview as well. Sounds like a very interesting thing. EatTheButter.org. You have some websites, right? Howard: And what is your URL? URLs or whatever. Dr. Childers: I’m on twitter as @AnnChildersMD. That’s probably my biggest following. We have over 5000 followers now. I also have a blog: annchilders.blogspot.com. And I spell my first name without an E. Probably that’ll be easy for people. Howard: annchilders.blogspot. So have you ever thought about doing your own instead of doing blogspot? Dr. Childers: Yeah, I’m thinking about it. Actually, our company, Life Balance Northwest LLC is putting together a website now…we’re putting together a more formal one, which will be a nice port through which people can access the blog and access some videos. Dr. Childers: Oh, I didn’t know. Howard: If you don’t own your own blog, you’re basically at the mercy of whoever does. Dr. Childers: Oh I see. Okay, well, thank you. Howard: So I would recommend… and I’d be happy to help you with that as well. Howard: I do that sort of thing. Howard: So, you’ve been pretty busy… by the way, when is the wedding? Dr. Childers: Stan and I will be in Great Britain with his children and their significant others and then with my niece and her husband and we will be there between the 11th and the 19th of September of this year. Howard: So you’re gonna to do it then? But you haven’t set an exact date? Dr. Childers: Not an exact date. Howard: You’re just gonna go do it. Dr. Childers: Go do it. That’s right. Howard: That’s kind of interesting. But neither one of you are actually citizens of the UK, right? Howard: That’s interesting. I thought you had to have some special status, pay some special tax in the Euro zone in order to be legally wedded. Dr. Childers: We’ll have everything arranged from before. But we’ll have our ceremony there. Howard: Well, I’m sure that it will be a great time. And I hope that all of that turns out just like you want it to. Howard: It has been a delight to have you on again. I do wanna warn you that it probably will take a while for me to get all of the videos processed and posted this year because we’re in the middle of a chaos. I just got a job in Tulsa, Oklahoma and we’re moving from the North Texas up there over the next couple of weeks. And so getting the videos done probably won’t exactly top of mind. But we’ll get around to it. Howard: So thank you very much. Dr. Childers: It’s my pleasure, Howard.